First of all I’m Irish born and bred, apart from spending the greater part of my first two years living in London, of which I remember little. Though I always dreamed of being a writer, I took a rather circuitous route getting here. You could say I have had several incarnations in this lifetime from Home Economics teacher to Fashion Editor of a magazine, along with being mother to my three wonderful children, Mark, Janet and Emily. Due to demand from clients I opened my own pr consultancy firm specializing in fashion; - the dream job for a fashionista, availing of great discounts on wonderful shoes and vintage clothing! Sadly it was not meant to last as in 2004 my health deteriorated and as a result, work had to take a back seat. I became interested in holistic medicine, personal development and writing in an attempt to cope with my diagnosis of fibromyalgia. In the process, I developed a passion for mythology, philosophy and the study of ancient spiritual traditions. As a spiritual seeker, I’ve travelled to Mayan sites in Mexico, visited a famous healer’s ashram in Brazil and undertook a shamanic journey through Peru. I am also a trained bio-energy therapist and have my Grandfather’s ability to channel healing for others. I love to dance, walk in nature and cook for family and friends. Mary runs a website called Goddess MECA which stands for Mary Elizabeth Coen Assists the Goddess in everywoman through sharing her love of cookery fashion and mythology. A woman's voyage of self discovery starts on the internet, leading all the way to a famous Brazilian healer's ashram and a shamanic journey through Peru. 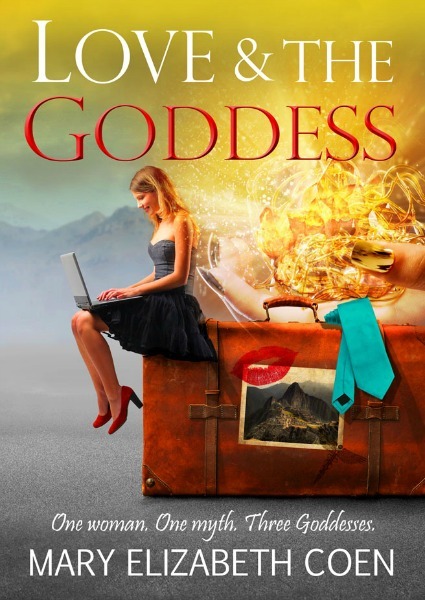 Kate explores the world of on- line dating using the name of a Greek Goddess. In the midst of a mad dating frenzy, Kate has a traumatic health scare, which convinces her to drop everything and go in search of a guru. Travelling with Ella, she visits a spiritual healer in Brazil, only to find Ella is more interested in having fun than seeking enlightenment. Next stop Peru, where a shaman tells her how to harness the energy of the Goddess and the Divine Feminine. Kate's journey of self discovery continues apace after she returns home and events unfold in a surprising manner, as she learns to think for herself.